You can tell from the photos that we enjoy paddling folding kayaks. We have found folding kayaks perfect for our adventures. The Aegean archipelago consists of numerous islands that are served by ferries. Island hoping with a hardshell kayak did not appeal to us. Loading a heavy plastic kayak in a ferry is not an easy task, so we decided to use folding kayaks. Travelling with a lightweight folding boat is so much easier. We pack the kayaks into their bags and we load them in the car deck of the ferry. On arrival, we unload the bags on the ferry dock and assemble the kayaks. By the end of the expedition, we pack the boats back to their bags and we load them on cars, taxis, buses or on the ferries. Hard shell kayaks have their own advantages, however, our expeditions encompass diverse means of transportation, hence the need for folding kayaks. In addition, we enjoy travelling overseas, so we fly internationally with our folders. Folding kayaks offer great portability and ease of transportation. We venture out on the sea with the Feathercraft Klondike and the Folbot Greenland II. On a daily basis we paddle the Folbot Cooper and the Feathercraft Khatsalano. 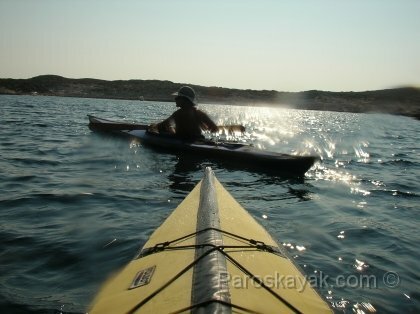 Any of these sea kayaks are fun to paddle giving years of pleasure on the water. Check out our expeditions pages for the seaworthiness of these fine vessells and how they take on rough waters with ease.